The Earth has a water scarcity problem, and it appears to be getting worse. The amount of fresh water on the planet has remained fairly constant over time, but the world’s population and the demands for usable fresh water have increased dramatically. A number of companies are developing technologies and infrastructure to help meet global demand, and a variety of water-focused exchange-traded funds (ETFs) give investors the opportunity to invest in and support those efforts. According to the United Nations, water use has grown at more than twice the rate of population increase in the past century, and agricultural demands and water waste continue to increase. Only 2.5% of the water on Earth is fresh water, and just 1% of the fresh water is easily accessible. By 2025, it’s estimated that that 1.8 billion people will be living in areas with water scarcity problems. These statistics show a worrisome trend, making it clear that we need a breakthrough in clean water technology, or at the very least a breakthrough in the infrastructure systems that bring fresh water to those in need. Some enterprising companies are trying to do exactly that, and a number of ETFs give investors access to those companies. The only real option in Canada is the iShares Global Water Index ETF (TSX: CWW), which tracks the S&P Global Water Index. According to iShares, this ETF will give you access to 50 companies from developed markets “selected on the basis of relative importance of the global water industry within their business models.” The methodology results in top holdings that include well-established utilities and infrastructure companies from around the world, such as American Water Works Inc. (NYSE: AWK) and U.K.-based United Utilities Group (LSE: UU). As can be seen in Chart 1, over the past 10 years to July 31, CWW has delivered an average annual compounded rate of return of 6.6% edging out the 6% posted by the Dow Jones Global TR Index. If you look south of the border, you can find a few more ETFs focusing on water equities. 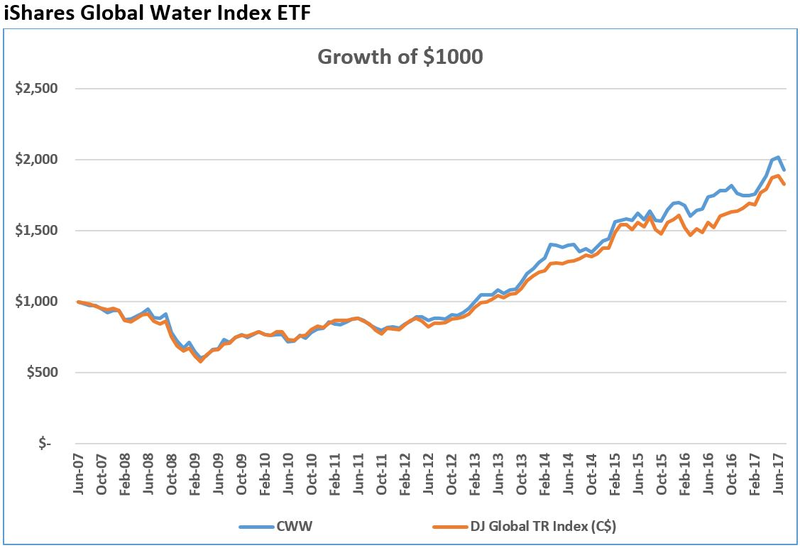 The U.S. equivalent to CWW is the Guggenheim S&P Global Water Index ETF (NYSE: CGW), which provides the same exposure to the S&P Global Water Index as CWW, but in U.S. dollars. A number of other water ETFs are also available: PowerShares Global Water Portfolio (NASDAQ: PIO), which is based on the NASDAQ OMX Global Water Index and PowerShares Water Resources Portfolio (NASDAQ: PHO), which follows the NASDAQ OMX US Water Index. The First Trust Water ETF (NYSE: FIW) tracks the ISE Clean Edge Water Index, while the Summit Water Infrastructure Multifactor ETF (NYSE Arca: WTRX) provides exposure to the Summit Zacks Global Water Index and the Tortoise Water Fund (BATS: TBLU) which tracks the Tortoise Water Index. While there are a number of different water equity indices available, the underlying theme is similar in that they consist of companies that derive significant revenues from delivering fresh water. Chart 2 compares the performance of the water ETFs since 2007, with the First Trust Water ETF significantly outperforming its peers. Given the relatively small universe of water companies, there is bound to be some overlap in the portfolios of these ETFs. I’ll highlight two of the more interesting companies here. 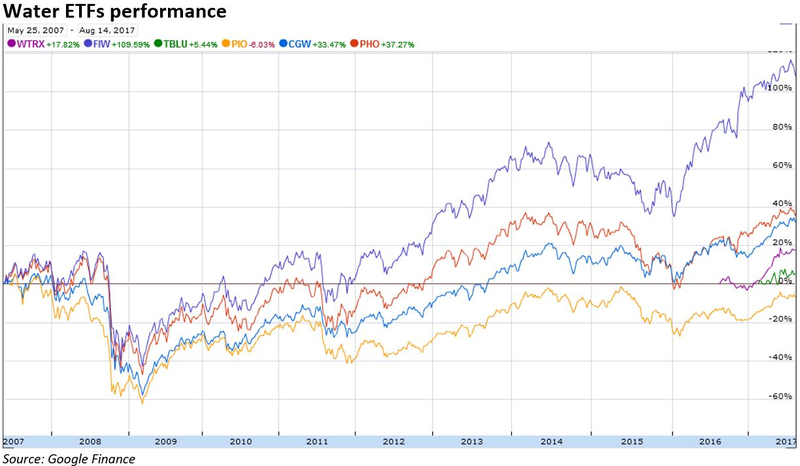 Geberit AG (VTX: GEBN) is a Swiss company and is a top holding in PIO, WTRX, and CGW. The company’s mission is to “continuously improve the quality of people’s lives with innovative sanitary products,” and it does this through three main areas of product: sanitary systems; piping systems; and sanitary ceramics. Over the past five years to mid-August, the stock price has risen to US$479.70 from US$193.90, and it pays an annual dividend, which yielded 2.08%. U.S. company Ecolab Inc. (NYSE: ECL) is another popular holding of water ETFs. It describes itself as “the global leader in water, hygiene and energy technologies and services” and works to ensure that “water and energy are available everywhere.” Ecolab employs innovative technologies to help customers use less water and maximize efficiency in water use. ECL’s stock price has risen from to US$131.30 from US$65.34 over the past five years to mid-August, and the dividend has increased each year, for a current yield of 1.13% at recent prices. 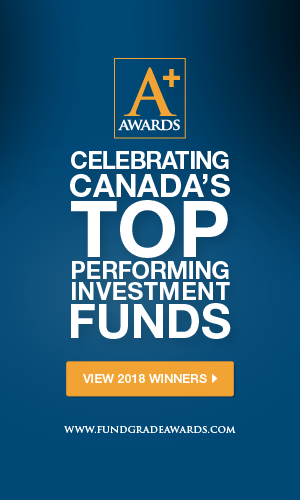 Reid Baker is Director, Analytics and Data, at Fundata Canada Inc., a leading source for investment fund information, and is Chairman of the Canadian Investment Funds Standards Committee (CIFSC).